talkhealth > Blog > 2018/04 > Sodium healthy or unhealthy? Salt has kind of been put into the same bracket of saturated fat in which its been deemed unhealthy for so long that we believe it to simply be true, but like saturated fat we’re finding out that there is more to it than just the blanket term that it’s unhealthy. Just like the controversy saturated fat has stirred up, sodium seems to have been solely blamed for hypertension, heart disease and strokes often being referred to as the single most harmful substance in the food supply. 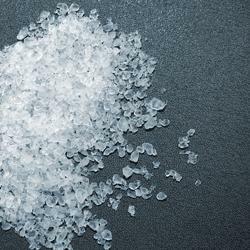 Yes, the average American consumes on average 10 grams of salt a day of which 75% comes from processed foods meaning its table salt-sodium chloride which lacks all the other elements that a sea salt or Himalayan salt would provide us with like potassium, sodium’s synergistic electrolyte. I’ll share later how in otherwise healthy individuals low salt intake actually causes an increase in all causes of mortality when in fact salt intake reasonably higher than the RDA proves to be health promoting. Sodium is an electrolyte and the body needs an adequate amount of electrolytes in a balance to work optimally. When we exercise we tend to lose a tremendous amount of salt via our sweat ducts and only replacing our sweat with neat water isn’t optimizing our potential for performance. “Studies in Canada at McGill and McMaster Universities have concluded that unless one has a specific and serious condition that would preclude them from taking in salt, then salt intake will produce no negative health problems, and could actually be health promoting. As a matter of fact, only 10% of hypertension cases have a known cause, and in almost all of these cases, the cause was either genetic or stress related” See the list below for potential causes of high blood pressure, which are easily modifiable lifestyle factors. When athletes or even health-conscious people begin to train hard and for prolonged periods of time or even for twice a day sessions we begin to sweat a lot more losing vast amounts of water and sodium along the way. Couple this with cleaning up our diets and moving towards a much healthier diet with a lot less processed foods which is a good thing, but as we begin to drastically lower our salt intake we may notice a drop in performance, increase in fatigue levels as a result of table salt being put into most processed foods. So why is sodium so important for athletes? Sodium and potassium work in synergy with each other to keep the integrity of the cell intact, sodium being outside the cell and potassium inside the cell. We use a method called the sodium-potassium pump to transfer the electrolytes to the cell membrane when needed. This process directly impacts on blood volume and therefore blood pressure as well as many other functions within the body. But blood volume and pressure is important for athletes during exercise because they help supply the muscles with adequate amounts of oxygen, and nutrients when under pressure to keep performance high as well as remove waste products away from the area that is likely to prolonging fatigue. Hence if we have lower than optimal levels of sodium we would have less oxygen and nutrients getting to the muscles and a higher accumulation of waste products than optimal. Potassium has some very crucial roles within the body and relies on sodium to become effective and vise versa, hence the need to maintain an electrolyte balance between these two synergetic electrolytes. When we have the correct balance of potassium and sodium water balance is regulated, which prevents from water retention within the cells, the acid-base balance in blood and tissue is maintained. In nerve cells, sodium potassium influx aids the electrical potential, which results in the conduction of a nerve impulse and finally movement including regulation of the heartbeat. Potassium also plays roles within energy metabolism such as synthesis of protein from amino acids, plays a role within carbohydrate metabolism playing an active part in converting glucose to glycogen for energy to be stored in the liver for future energy. Our kidneys continuously excrete potassium regardless of how much we have within our body, hence the importance of striving to keep this electrolyte within the diet if you want a healthy body. For athletes who want a rapid exchange of nutrients/electrolytes to keep performance high due to the high demand, it’s essential to have adequate levels ingested. Active transport of potassium into the cells is shuttled in by sodium via active transport, but this is a metabolically expensive process so if we’re lacking the needed nutrients the thyroid has the ability to slow down our resting caloric expenditure and BMR because we can’t process this metabolic pathway at the rate needed to sustain the level of output desired creating fatigue and decreased performance, as an athlete this is terrible news but easily fixed with correct nutrition planning both acutely and long-term. The bodies main loss of sodium is via sweat glands, athletes with high outputs will find they lose high amounts of sodium everyday especially athletes who train twice a day and use sauna’s and steam rooms for recovery. Having large losses of sodium signals the release of the hormone aldosterone to be released, which is a stress hormone, released by the adrenal glands. It aims to conserve sodium loss and promote potassium excretion to balance homeostatic regulation of electrolytes through the kidneys, saliva and sweat glands. This is the hormone responsible for water retention or loss, bodybuilders or athletes doing water cuts want to influence this hormone to dehydrate or make weight for shows or competitions, it also plays a huge role on blood pressure as aldosterone effects blood volume by controlling sodium and potassium levels. Aldosterone is part of the rennin-angiotensin-aldosterone-system, which directly affects blood pressure, antihypertensive drugs work by inhibiting aldosterone’s secretion, the net result being increased sodium excretion and potassium retention. The case of the athletes with high outputs and low sodium intakes drinking neat water tends to exacerbate the problem. The persistent loss of sodium eventually becomes chronic and potassium ends up leaving the cell to replace sodium producing a dysfunctional cell ultimately causing muscle weakness, cramp, flat looking physique and lethargy. The way in which water retention works is water follows sodium because sodium is positively charged and water is negatively charged. In the presence of aldosterone, sodium is held onto by the body and not secreted; the water follows the sodium into the cell causing water retention as a result. It can be the case that the fatigue from dieting and intense training can be improved by introducing sodium into your protocol. If you’ve been dieting for weeks it can be expected that fatigue will accumulate due to the hypo-caloric intake but ensuring sodium levels will be a good precaution. If you’ve been dieting for a long period of time and sodium is at a favorable level and you’re no longer losing weight it could be time to introduce a diet break to give the body a break and rebalance hormones such as leptin, ghrelin, and thyroid etc. Water and sodium needs for an athlete should consist of your body weight in KG x 0.033 = water in liters you should drink each day and 2 grams of sodium per day per liter of water that you drink. Athletes new to taking sodium may experience some initial water retention but if the sodium and water intake levels are consistent this will dissipate over time and the benefits in physique and performance will be noticed. There is a small percentage of the population that has a hypersensitivity to salt and will have a dramatic change to blood pressure with a variation of sodium within the diet, these people are no different to individuals with nut allergies or lactose intolerance and should not be the rule regarding sodium intake but the exception. This being said you must pay attention to your blood pressure when you begin to increase sodium within the diet to ensure you’re not one of these hypersensitive types and that you’re not using table salt as your chosen source to get sodium in, remembering that these guidelines are for athletes performing at high intensities potentially multiple times per day. Sodium has been related to high blood pressure for a long time now, and high blood pressure is extremely dangerous increasing the risk of heart failure, coronary heart disease and stroke with 1 in 4 people suffering from hypertension. Sodium and blood pressure levels have been increasing worldwide along with the increase in processed foods that carries the salt. Some additional changes were also noticed that play a role in hypertension is body mass index, stress, lack of physical exercise, decrease potassium consumption, lack of sleep and smoking rates. 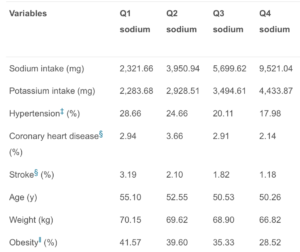 All of these factors contribute to hypertension, not just salt intake, even though the Paleolithic man consumed very little sodium we’re finding that higher sodium intakes are correlated to higher life expectancy as seen in the Intersalt study. It clear to see here also that a low sodium intake even puts you at a higher risk of mortality as our body works extremely hard to conserve sodium when intakes are low as many important metabolic functions won’t work in the absence of sodium and here is were aldosterone comes in to conserve sodium and stop it from being passed through the urine. Aldosterone is not something you want consistently high levels of either, as it’s associated with increased inflammation, kidney disease, osteoporosis and cardiovascular disease. The traditional route is to use ACE inhibitors to block RAAS pathway and bring blood pressure down, but adequate sodium levels could do this for you in the correct dosage balanced with the correct cofactors, so I’m promoting that we use diet and lifestyle factors as well as what your doctor suggestions to keep you healthy. The exact amount of sodium that you actually need is hard to say as we all have different rates of sweat and lifestyle factors that cause us to lose sodium. Some sodium wasting effects are exercise, coffee, low insulin level (keto), temperature, medications or diuretics or illness that causes vomiting or diarrhea. In these circumstances, you may need to autoregulate your intake, as normal doses may be inadequate for your needs but be sure to use a mineral dense salt not table salt. 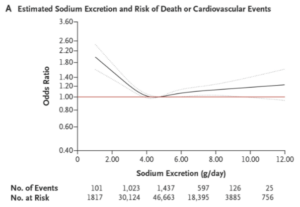 High blood pressure from salt increase can usually be explained by a potassium deficiency, as you can see below in the table from Sodium intake and prevalence of hypertension, coronary heart disease, and stroke in Korean adults study as sodium levels increased so did potassium levels with no ill effects. Likely due to most of their salt intake coming from salting vegetables. There are people out there who are hypersensitive to salt and see an increase blood pressure as sodium increases within in diet. These people should consider monitoring their intakes much more closely and check blood pressure regularly to monitor what their upper limit of sodium per day actually is. These people are just a small group of the population similar to people who are lactose intolerant or have a peanut allergy, they just have to identify themselves as being hypersensitive and take practical steps around their diet to compensate for this sensitivity. This information is not to replace that of your doctor but to support diet and lifestyle factors that you may implement, always consult your doctor before taking drastic action. One Response to Sodium healthy or unhealthy? Really interesting article. Provides some well balanced arguments and information.